They may have been born in different countries, but there’s no denying outstanding on-ice chemistry between the two homegrown brothers, Kim Ki-sung and Kim Sang-wook, and U.S.-born forward Mike Testwuide on the top line of the South Korean men’s hockey team. And Testwuide, a Colorado native who acquired his South Korean passport in 2015, wouldn’t want to play on any other line. “They’re two of the best players on our team. Getting to play with them is pretty awesome,” Testwuide told Yonhap News Agency on Wednesday at Jincheon National Training Center in Jincheon, some 90 kilometers south of Seoul. The men’s hockey team had an open house day here with the last camp under way before the 25-man roster is finalized. “Their talent is some of the best in the world. I get to benefit from those guys,” Testwuide added. The trio’s great teamwork was hardly more evident than during the Channel One Cup tournament in Moscow last month. South Korea lost all three of its games, falling to world No. 1 Canada 4-2, third-ranked Sweden 5-1 and world No. 4 Finland 4-1. And all four South Korean goals were created by the Kim-Kim-Testwuide line. In fact, they were the only three South Korean players to register a point. Kim Sang-wook had two goals and an assist. His older brother had a goal and three helpers, while Testwuide had one goal and one assist. More so than the offensive output, Testwuide said his line also did yeoman’s work on defense. On another positive note, Testwuide said he’s 100 percent healthy, after an injury-plagued 2017 season. Most notably, at the Asian Winter Games in Sapporo, Japan, in February last year, Testwuide crashed into Kazakhstan goalie Vitali Kolesnik on a breakaway and suffered ligament damage to his left shoulder. The 30-year-old played NCAA hockey at Colorado College and spent a few years in the American Hockey League (AHL). 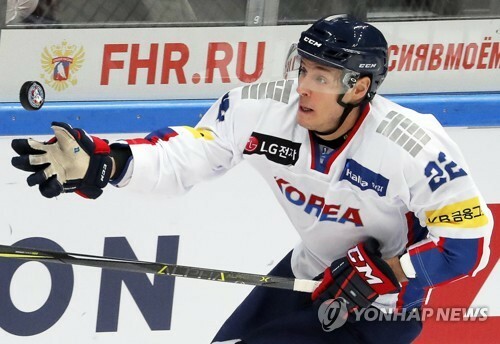 Though he never got to the big show that is the National Hockey League (NHL), Testwuide has carved out a niche in the Asia League Ice Hockey with Anyang Halla and High1. He has reigned as one of the league’s top scorers since 2013. Testwuide would have had a chance to test himself against the NHL stars at the Olympics, but the world’s top league decided to skip PyeongChang after sending its players to the previous five Winter Olympics. at VTB Ice Palace in Moscow. Head coach Jim Paek, former NHL defenseman, opened the final pre-Olympic camp Monday with 36 players on hand. Only 25 of them will get to play in the Olympics. And for the last 25 standing, playing to their strength will be the key at PyeongChang, Testwuide said.